The human back. That complex arrangement of overlapping muscles, tendons, and ligaments all surrounding an adjoined column of bones encasing a half-meter-long bundle of delicate nerves that serves as the essential link between the brain and the rest of the body. Add to this the constant twisting, bending, and other stresses wreaked on this crucial structure, and it is no surprise why back pain is one of the most common medical problems plaguing adults, with over 80% having experienced it at least once in their life…with many enduring it on a chronic basis. Fortunately, for many people, there are things that can be done to reduce low back pain and to prevent it from reoccurring in the future. This article will focus on one of the most effective ways—physical conditioning of the back—by guiding you through nine easy, low-impact moves that will improve its strength and flexibility. As one of the most common causes of non-chronic low back pain, back strain can affect people of any age. Lifting a heavy object, twisting, or sudden movements can all cause microscopic tears to develop in your muscles and ligaments, which then become inflamed. This inflammation leads to muscle spasms that cause the pain and stiffness you experience, with the symptoms themselves ranging from an annoying ache to a debilitating pain preventing you from carrying on your normal life. So why are some people more prone to back strain than others? It is because your spine is supported largely by your core—the muscles that make up your back, abdomen, pelvis, and buttocks. Whenever any of these muscles become weakened or stiff, not only are the muscles more prone to injury, but the increased burden on the spine itself can lead to instability and structural damage over time. Similar to how reinforced steel can bear significantly more weight than an aluminum pole, a strong, well-conditioned back can withstand considerably more stress than one that has not been strengthened through exercise. When regularly performed, these types of maneuvers decrease stiffness and reinforce the supporting muscles, protecting your spine and making you less susceptible to daily stresses. Not only that, but when done properly and gradually, low-impact exercises improve circulation into the tissues, disc spaces, and around the ligaments in the back, facilitating the healing of strained muscles. In contrast to a muscle strain, sciatic nerve pain—or sciatica—feels quite different. The sciatic nerve is the largest single nerve in your body and is composed of individual nerve roots that branch out from your lower spine to combine and form the sciatic nerve. The word “sciatica” describes the various symptoms one experiences when the sciatic nerve is compressed or irritated by some cause. Often times, the culprit is a herniated disc (eg. ‘slipped‘ or ‘bulging‘ disc) that results in a pinched nerve. However, a number of other conditions, including degenerative disc disease (age-related weakening of spinal discs), arthritis of the spine, and muscle inflammation and spasm can all lead to irritation of the sciatic nerve, causing sciatica. While the specific symptoms of sciatic nerve pain vary widely and depend on the location of nerve involvement, they are usually characterized by pain or tingling in the lower back or buttocks that travels down the back of the leg, which can then lead to weakness in the leg or foot. 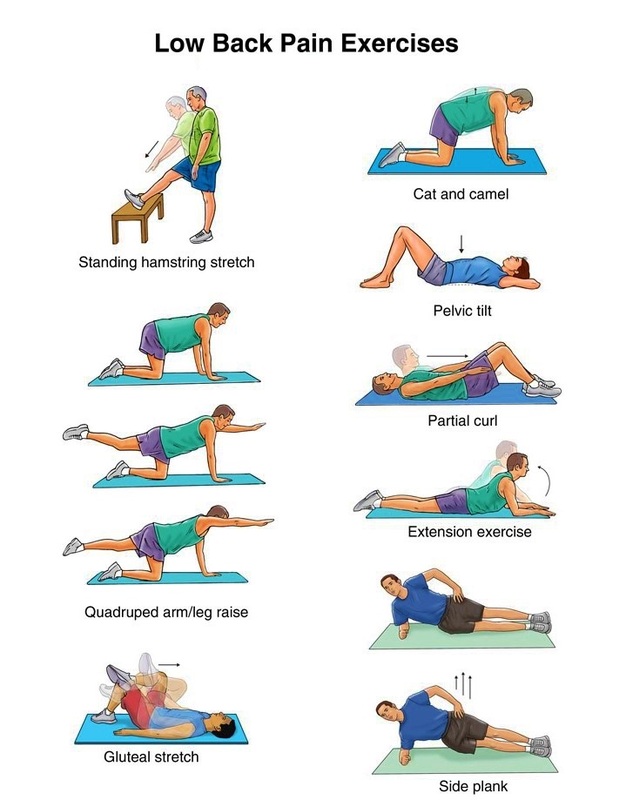 For those with sciatica caused by a herniated disc, regular exercise is a useful component of pain management. In addition to improving spinal support, certain low-impact exercises, when properly done, facilitate the exchange of nutrients and fluids within your spinal discs, keeping them healthy and preventing them from exerting extra pressure onto the sciatic nerve. With that said, let’s get started! For your reference and convenience, printable illustrations of all these exercises are provided at the end of this post. Try to incorporate the exercises into your days, aiming to do them regularly at least 4 times a week. Go slow and be patient; depending on your physical condition, it may take several weeks before you ‘feel’ a difference. Nevertheless, rest assured that you are benefiting from them. Consider working with a physical therapist or trained specialist to develop the proper form and to focus on exercises that are targeted to your specific needs. And most importantly, always check with your doctor before starting any exercise regimen for the first time, especially if you are currently having back pain or had a recent injury. On that line, if you have persistent back pain or pain that worsens over time, it is even more crucial to see a physician or a spine specialist for proper evaluation and diagnosis and for the ruling out of serious conditions. These stretching exercises are designed to improve flexibility of your spine by restoring movement within the vertebrae and their surrounding muscles and ligaments. Exercises marked with an asterisk (*) are ones that are also appropriate for those with sciatic nerve pain caused by herniated discs. The hamstrings run through the back of your thighs. Tightness in this muscle limits motion in the pelvis which then increase stress across the lower back, affecting your posture. This maneuver gradually lengthens the hamstrings to reduce the stress on the lower back. Starting position: Place the heel of your leg on a stool about 15 inches (38 cm) high. Keep your knee straight. Action: Lean forward, bending at the hips until you feel a mild stretch in the back of your thigh. Do not roll your shoulders or bend at the waist. Hold this position for 15 to 30 seconds. Alternate legs and repeat 3 times on each side. Starting position: First lie face down on the floor for 5 minutes. If this hurts too much, place a pillow under your stomach for a minute before removing it. When you can lie on your stomach for 5 minutes without a pillow, continue onto the next part. Do 4 sets, resting for a minute in between. Starting position: Lie on your back with both knees bent, the ankle of one leg resting over the knee of your other leg. Action: Grasp the thigh of the bottom leg and pull it in toward your chest. You should feel a stretch in your top leg deep into your buttocks, hips, as well as lower back area; you may also feel it along the side or back of your thigh. Hold this position for 20 seconds. Switch to the other leg. Do this 3 times with each leg. Action: As you inhale, let your stomach sag, allowing your back to curve slowly downward, one vertebra at a time. Hold for 5 seconds before returning to neutral position. 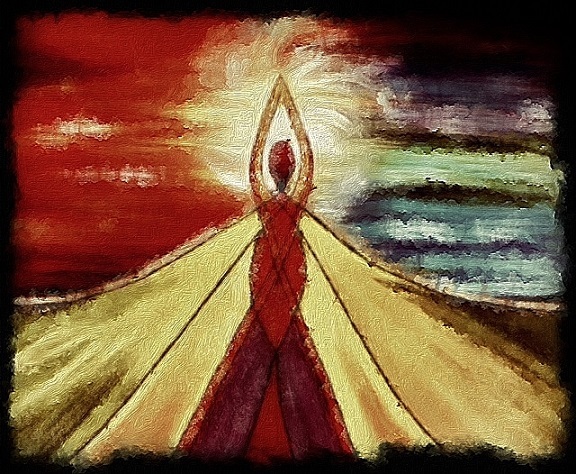 Then, as you exhale, pull your stomach inwards as you round your back (like a frightened cat). You should feel your abdominal muscles tighten. Hold this position for 5 seconds before returning to the neutral position. Repeat this 10 times. Work up to doing 3 sets. Starting position: Get down on your hands and knees in a similar position as above. Keep your head in a neutral position. Action: Start by tightening your abdomen to stiffen the spine. Being mindful to keep it tightened, raise one arm and the opposite leg away from you until they are parallel to the floor. Hold this position for 5 seconds. Lower your arm and leg slowly and switch sides. Do this 10 times on each side. Work up to doing 3 sets, resting in between. Action: As you exhale, tighten your abdominal muscles as you gradually flatten your lower back into the floor. Hold this position for 5 seconds, then relax. Now inhale as you tilt your pelvis the other direction by arching your lower back, feeling your back muscles tighten. Hold for 5 seconds before relaxing. Repeat 10 times, working up to 3 sets. Action: With your arms stretched forward, slowly exhale, and curl your body forward as if doing a sit-up, focusing on tightening your abdominal muscles. Stop once your shoulders clear the floor. Hold for 3 seconds. Relax and return to starting position. Repeat 10 times, gradually working up to 3 sets. Starting position: Turn onto your right side with your legs extended and your feet and hips resting on the ground and stacked on top of each other. Prop up your torso by placing your right elbow on the ground directly under your shoulder, aligning your head with your spine. Action: As you exhale, tighten your abdomen as you lift your hips and knees off the floor, balancing on your forearm and the outside of your foot. Hold for 10 before relaxing. Switch sides and repeat. Gradually work up to maintaining the position for a one minute. Note: You can decrease the difficulty of this by starting with your knees and hips flexed to 45° angles. Starting position: Lie on your back with your knees bent, arms at your sides, feet flat on the floor. Action: Draw in your abdomen and tighten your abdominal muscles. While keeping your knees bent, lift one leg until the knee is over your hip, holding for 5 seconds before lowering it. Repeat this exercise with the opposite leg. Then lift your arm over your head, holding for 5 seconds before lowering it. Repeat with the opposite arm. When you can do this easily, start raising one leg and the opposite arm together, holding the position for 5 seconds. Lower your arm and leg and raise the opposite arm and leg up and hold for 5 seconds. Remember to keep your abdominal muscles tight throughout. Once this becomes comfortable, lift both feet and arms off the floor and keep them slightly above ground as you complete the above maneuver. Do not let your lowered arms and legs touch the ground. You should feel your abdominal muscles working harder. Here’s to moving towards better back health! *Like always, the information provided in this article is for educational purposes only and is not to be used in place of medical advice or in the diagnosis and treatment of any medical condition. Remember to always talk with your trusted health care provider before starting any exercise regimen, including this. Thank you very much for the exercises. I’ve experienced everything you’ve described here plus surgery and shots. I’ll print the cards for easy reference. Again, thank you. Extremely useful information. The problem for my 78-year-old husband is that he is unable to do those types of exercises. He does stretches (standing up) and has physical therapy on and off. Do you have any other recommendations that may help him? (He does walk quite a bit and also swims). Thank you, Phoebe. I hope this helps. If he actually prefers standing exercises to seated, let me know. Take care! Thanks so much, Phoebe. You are a dear. Very good post! 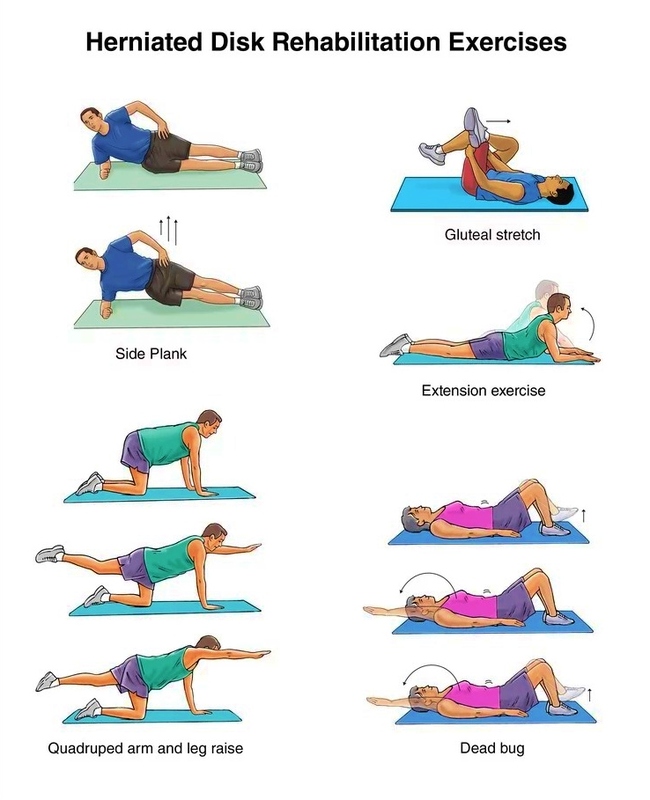 Thank you for sharing this exercises, I’m not old, but back pain happen sometimes. I need to start these exercises. I have gained over 30 pounds in the last two years. I need to change my diet as well, but I used to be thin, no weight problem, as soon as I hit my late 40’s, everything changed. Thanks for these. I’m confident that with small changes and some motivation, you can do it! Thanks for reading. Take care! Thank you, the motivation is the biggest part I need to work on. What a lot of work you have done here to help us, Phoebe. Thank you. I use most of these techniques and I swim and am losing weight. Behold, a new person! This was very informative. With a possible diagnosis of ankylosing spondylitis, it was interesting to read and read about possible exercises I can do.